"I Am the Vine" Cross Pendant crafted in .925 sterling silver. Cross measures 23.5mm x 12.5mm in size (just under 1" tall x 1/2" wide). Add a sterling silver box chain necklace (optional). As Christians, we are called to do good works, not for salvation, but for discipleship and holy living; and the only way to produce good fruit is to abide in Jesus Christ by walking according to the Spirit, rather than the flesh. 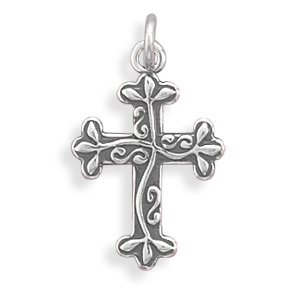 We guarantee our I Am the Vine Cross Pendant, Sterling Silver to be high quality, authentic jewelry, as described above.